A 3.9 magnitude quake jolted residents in the South Bay Monday morning. 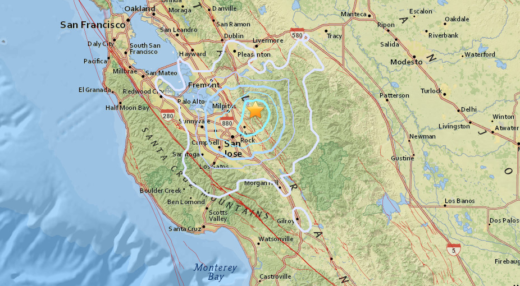 The U.S. Geological Survey says the quake, centered northeast of Alum Rock, struck around 9:40 a.m. The earthquake was close to, and mostly likely on, the Calaveras fault. A San Jose Fire Department spokesman says there are no reports of injuries or damage. The shaking lasted about 10 seconds. As of 11 a.m. more than 4,600 people reported feeling the quake on the U.S.G.S. page "Did You Feel It?" Monday morning had a slightly apocalyptic feel to it in the South Bay, as pointed out by the San Jose Mercury News and area Tweeters. So far, no locusts reported.